Michael Muenchow was born in San Antonio, Texas on October 7, 1986 where his passion for the arts quickly moved him to get involved in singing, acting, and dance classes. Inspired by his family’s latin “noche bohemia” traditions, Michael was most influenced by his family in his desire to entertain. Michael was cast on International Television’s talent-based reality show (similar to the popular U.S. shows American Idol and Big Brother) based in Mexico City. La Academia USA was one of the greatest experiences of his life. Michael was among the top 12 contestants chosen out of over 10,000 people who auditioned. He spent three months training 24 hours a day 7 days a week by well known professionals in singing, acting, dancing, and interpretation. Performing every weekend on stage for millions of people and being a part of the daily reality show Camino A La Fama became his life during La Academia USA. During this monumental time he was put through intense training that taught him everything he would need to become an entertainment star. Michael’s year on the show served as the 5th year the ever-popular La Academia was on the air but the first year of La Academia USA. One year prior, Michael was a part of Nuevas Voces de America, another reality-based talent show in Miami, Florida. World famous music mogul Emilio Estefan hand picked 20 talented vocal performers from throughout the U.S. and Puerto Rico. Out of about 30,000 people who auditioned, Michael was selected, trained, and shown the ropes of the entertainment industry through the eyes of producers and stars alike. Aside from reality-shows, Michael has held lead roles in many musicals. He has been in such musicals as Bye Bye Birdie, Cinderella (Rossini’s Opera and Rogers & Hammerstein’s), Joseph and the Amazing Technicolor Dreamcoat, and more. He has also been in productions of Les Miserables as Marius, The Exonerated, Amadeus, The Boys In The Band, and other theater productions. After completing his studies in theater he continued to work professionally in Texas regional theatre. In the past, Michael has performed at the Hobby Center in Houston, in productions of RENT at both the Zach Theatre and Casa Manana, in a production of Company benefiting the Breast Cancer Resource Center, and on tour with Broadway/YouTube star, Todrick Hall. You may have seen Michael in commercials throughout Texas, and in the popular NBC series Friday Night Lights, where he was cast as featured talent for the entire 3rd season of the series, appearing as a core Panther’s football player. After finishing an 11 month contract as the lead male singer on the Holland America ms Nieuw Amsterdam, Michael is now living in New York City. 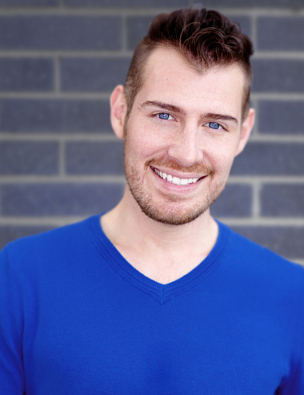 He is co-host of the live-singing cabaret show Final Callback which had a year run at The Metropolitan Room and is actively auditioning in hopes to take his talent to the loving audiences of Broadway.